If you have kids or rowdy pets, then you've probably had to deal with more than one stubborn mud stain. 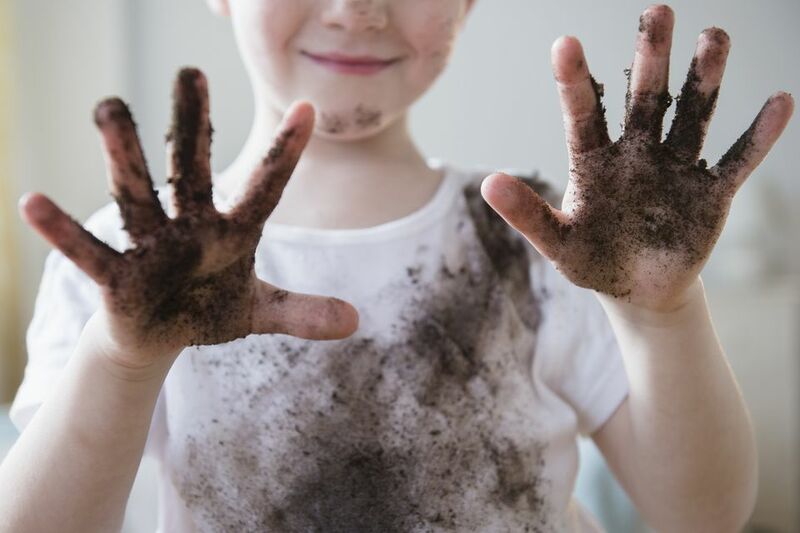 While dirt can make quite a mess, it's not as hard to clean up as it looks. As long as you don't set a mud stain by putting it in the dryer, you can probably save your muddy garment. Whether your mess is big or small, this trick will help you get your all your clothes looking good as new. With these simple steps, you'll have your muddy mess cleaned up in less than 30 minutes. Wait for the mud stain to dry. While you usually want to try to clean a stain quickly, when it comes to dirt, take the opposite approach. Let the clay dry thoroughly to prevent smearing. Do not attempt to wipe off the mud while it's still wet. It will only smear the stain onto more of the clothing. Scrape or vacuum off the mud-stained area. Once the mud stain has dried, use your scraping tool or vacuum the area to remove as much of the dried clumps of mud as possible. You want to try to get as much of the dirt off as you can with this step, but be careful not to mash it into the fabric further. Using detergent, soak the stained clothing. Rub liquid detergent into the stain and allow to soak for 15 minutes or until the stain no longer remains. Lightly rub the stained area between your fingers every three to five minutes to help loosen the stained area. Use a stain remover. If traces of the mud stain remain, apply a stain remover stick, gel, or spray and let stand for five minutes. Wash with liquid laundry detergent. You can hand wash the fabric or use a washing machine for this step. Follow the directions on the clothing label. Use warm water to wash the clothes. Repeat steps. If the mud stain still remains, repeat steps three through five until it is completely gone. Never use a clothes dryer on mud-stained clothing. It will set the stain and make it impossible to remove. Once you have removed the stain, wash and dry the clothing according to the fabric directions. Falling in white jeans may seem like a major disaster, but don't worry, you can save those pants! When you need to remove mud stains from white clothing, bleach is your secret weapon. Chlorine bleach is a strong stain remover, and it can damage some fabrics. Make sure you read the garment tag before using bleach. If your clothing can't stand up to bleach, use the same steps you would for other fabrics. Leather jackets add some instant cool to any outfit, however, mud stains do not. Getting dirt out of leather is a little trickier than most fabrics because water can also stain leather. If the clay is still wet, gently wipe off as much as you can with a damp towel; once you've gotten as much of the dirt off as you can, buff the leather with a dry cloth. If the mud has already dried, use a soft-bristled toothbrush to rub off as much of the soil as you can before rubbing it with a damp towel. Make sure to dry your leather off with a towel after you've cleaned it; you don't want to replace your mud stain with a water stain.